Two trains A and B cross each other when travelling in opposite direction in 36 seconds and when travelling in the same direction in 108 seconds. Length of train A is 400m and speed of train B is 60kmph. The train A has 5 coaches-S, T, U, V and W. Total number of passengers in coach S is 120 and the total number of passengers in coach U and V in the ratio of 6:5. The number of passengers in coach T is 60 more than of the number of passengers in coach S. The number of passengers in coach W and V is 20 and 30 less than the number of passengers in coach T respectively. If the fare of the ticket per person for reserved class and non reserved class is Rs.500 and Rs.250 respectively. Train B faster than train A and train A runs towards Chennai. 1. Out of the total number of passenger in the train A, 40% of the passengers bought unreserved ticket, then the total amount received by unreserved ticket is approximately what percent of the total amount received by reserved ticket? 2. If the number of passengers in below 18 years of train A in coach S and W is 25% and 30% respectively and the passengers in below 18 years in coach T is half of the below 18 years passengers in coach S. The ratio of the below 18 passengers in coach U and V is 5:4. The below 18 years passengers of coach V is two-three of the below 18 years passengers of coach W. If the railway department announced 20% discount is given on tickets of all passengers below 18 years, and the ratio of the reserved ticket and unreserved ticket passengers in below 18 is 3:2, then how much amount is collected from passengers of below 18 years? 3. Total distance between Delhi to Chennai is 720 km. Train B starts Journey after x hours of train A but reaches Chennai one hour before train A. The train A stops for 10 minutes on each station and train B did not stop at any station. If the total number of station between Delhi and Chennai is 24, then find value of x? 4. If the female passenger of coach S is 80 and the 40% of the passengers of coach T is females. The male passengers of coach T and U in the ratio of 9:7 and the male passengers of coach V is five-sixth of the number of female passengers of coach U. If the ratio of the male passengers in coach W to female passengers in coach V is 8:7 and the ratio of the female bought reserved ticket to unreserved ticket is 101:98, then find the difference between the total amount collected from reserved ticket (female bought) and the total amount collected from unreserved ticket (female bought)? 5. What is the difference between the time taken by train A crosses the 225 m long bridge and that of the time taken by the train B crosses the car running in the same direction at the speed of 42 kmph? 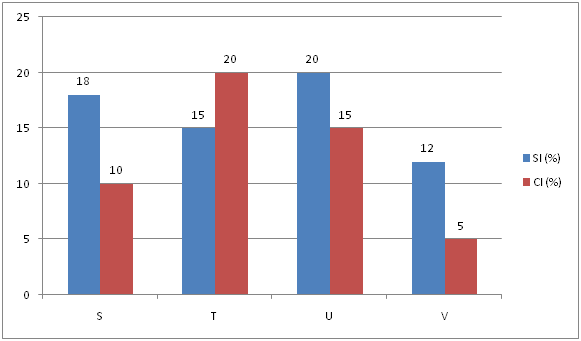 The given bar graph shows the rate of interest for four different schemes-S, T, U and V which is offers SI and CI. 6. A and B together can complete the piece of work for 12 days and B and C together can complete the same piece of work for 18 days. Efficiency of A is twice as C. B alone completes the work and got Rs. 240 per day and he invested his total earning in scheme S for CI, and then find the total amount received after 2 years? 7. A alone can do a piece of work in 6 days and B alone in 8 days. A and B undertook to do it for Rs. 3200. With the help of C, they completed the work in 3 days. C invested his 25% of earning in scheme V at SI for 5 years and then the total amount received from scheme V is invested in scheme T for CI for 2 years, and then find the Compound amount received by C after 2 years? 8. D and B together can complete the work in 18 days and B and C together can complete the work in 12 days. C can complete the same work in 28 days. D alone completes the work and got Rs.320 per day. D lent the total amount earned by him to E, who invested his amount in scheme U at SI for 3 years. E then added some money to the borrowed money and lent it to F for same time in scheme V at SI. If E gains Rs. 10324.8 by way of interest on borrowed sum as well as his own amount from the whole transaction, then find the sum lent by him to F? 9. A lent some amount from bank in scheme S for CI. A pays two installments of Rs. 2200 each at the end of each year and then the entire debt gets cleared. What the approximate value is borrowed? 10. A and B started the business in the investment ratio is 8:5. If divide 40% of the profit equally and rest in the proportion of their investment and A’s profit is Rs.740. If B invests his profit in scheme V for SI for 18 years, then find the total amount received by B after 18 years? 1) Out of the total number of passenger in the train A, 40% of the passengers bought unreserved ticket, then the total amount received by unreserved ticket is approximately what percent of the total amount received by reserved ticket? 2) If the number of passengers in below 18 years of train A in coach S and W is 25% and 30% respectively and the passengers in below 18 years in coach T is half of the below 18 years passengers in coach S. The ratio of the below 18 passengers in coach U and V is 5:4. The below 18 years passengers of coach V is two-three of the below 18 years passengers of coach W. If the railway department announced 20% discount is given on tickets of all passengers below 18 years, and the ratio of the reserved ticket and unreserved ticket passengers in below 18 is 3:2, then how much amount is collected from passengers of below 18 years? 3) Total distance between Delhi to Chennai is 720 km. Train B starts Journey after x hours of train A but reaches Chennai one hour before train A. The train A stops for 10 minutes on each station and train B did not stop at any station. If the total number of station between Delhi and Chennai is 24, then find value of x? 4) If the female passenger of coach S is 80 and the 40% of the passengers of coach T is females. The male passengers of coach T and U in the ratio of 9:7 and the male passengers of coach V is five-sixth of the number of female passengers of coach U. If the ratio of the male passengers in coach W to female passengers in coach V is 8:7 and the ratio of the female bought reserved ticket to unreserved ticket is 101:98, then find the difference between the total amount collected from reserved ticket (female bought) and the total amount collected from unreserved ticket (female bought)? 5) What is the difference between the time taken by train A crosses the 225 m long bridge and that of the time taken by the train B crosses the car running in the same direction at the speed of 42 kmph? 6) A and B together can complete the piece of work for 12 days and B and C together can complete the same piece of work for 18 days. Efficiency of A is twice as C. B alone completes the work and got Rs. 240 per day and he invested his total earning in scheme S for CI, and then find the total amount received after 2 years? 7) A alone can do a piece of work in 6 days and B alone in 8 days. A and B undertook to do it for Rs. 3200. With the help of C, they completed the work in 3 days. C invested his 25% of earning in scheme V at SI for 5 years and then the total amount received from scheme V is invested in scheme T for CI for 2 years, and then find the Compound amount received by C after 2 years? 8) D and B together can complete the work in 18 days and B and C together can complete the work in 12 days. C can complete the same work in 28 days. D alone completes the work and got Rs.320 per day. D lent the total amount earned by him to E, who invested his amount in scheme U at SI for 3 years. E then added some money to the borrowed money and lent it to F for same time in scheme V at SI. If E gains Rs. 10324.8 by way of interest on borrowed sum as well as his own amount from the whole transaction, then find the sum lent by him to F? 9) A lent some amount from bank in scheme S for CI. A pays two installments of Rs. 2200 each at the end of each year and then the entire debt gets cleared. What the approximate value is borrowed? 10) A and B started the business in the investment ratio is 8:5. If divide 40% of the profit equally and rest in the proportion of their investment and A’s profit is Rs.740. If B invests his profit in scheme V for SI for 18 years, then find the total amount received by B after 18 years?